Georges Lepape (1887-1971) was born in Paris where he studied at the Ecole des Beaux-Arts. Working as an illustrator of designs for pantaloon gowns by Paul Poiret from 1909, he captured the shocking yet anticipatory move towards allowing greater physical freedom in women's fashion. His collaboration with Poiret included the innovative compilation of limited-edition albums displaying fashion illustrations. 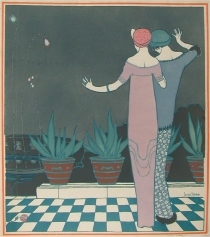 Lepape illustrated the collections of Jean Patou from 1912 and worked freelance to illustrate fashion deigns in magazines including Femina, Vogue and Harper's Bazaar. The sculptural simplicity and curvilinear style of his work was influenced by contemporary trends towards orientalism and movements such as Cubism.